Bilbee Wins Thriller for second Feature Win! Indianapolis, Indiana’s Nick Bilbee won his second career feature at Lawrenceburg Saturday night in an absolute thriller. The 25 lap Kelsey Chevrolet Sprint car feature went green to checkered in a tense but exciting feature race. Bilbee jumped to the lead on the start and brought along Kody Swanson who passed 8 cars in a matter of a couple laps to secure the runner up spot. Those two settled in for much of the race with Swanson able to close the gap on Bilbee only when they encountered slower traffic. Once Bilbee would clear the lapped traffic, he would stretch his lead out again. With 3 to go, Bilbee had caught a whole group of cars and attempted to lap them but the traffic was side by side and not leaving Bilbee with many options. This allowed Swanson one last shot at Bilbee but it wasn’t enough as Bilbee hung on for his second feature win. Swanson was second with Dickie Gaines, Garrett Abrams and Braxton Cummings rounding out the top 5. Heat race winners were Steve Thomas and Braxton Cummings. The Kelsey Chevrolet Sprint Cars return to the track on Saturday May 12th. Skipton Wins First Career Feature at Lawrenceburg! Greendale, Indiana’s Cory Skipton had been trying to tame the 3/8 mile high banked Lawrenceburg Speedway for quite some time. Many times Skipton would spin out or crash ending his chances at a good finish or victory. On this night, it would belong to him, and destiny would fall his way. He would start up front for the 20 lap Budweiser UMP Modified Feature and take the lead early on. He was running a great pace as the leader holding off challenges from Brandon Green and Brad Wieck. The 1 driver that everyone knew would cause the biggest threat was Josh Rice. Rice is considered one of the best modified drivers around and he gave Skipton everything he could handle. Rice passed Skipton for the lead twice only to have a yellow flag revert the scoring back to the previous lap putting Skipton back out front as the leader. On the final restart, Skipton was able to hold off Rice for the final lap and pick up his first career win at Lawrenceburg. Rice was second followed by Brandon Green, Brad Wieck, and Kyle Herbert. Heat race winners were Tyler Allison, Jim Szekacs, Brad Wieck. Brandon Stephens Picked up his First Career Hornet Win! Brandon Stephens led all 12 laps on his way to his first Besslers U Pull N Save Feature win on Saturday night at Lawrenceburg. The battle behind Stephens was fierce for the runner up spot with 15-year-old Dallas Miller fighting hard with Michael Skeens until Miller retired with a mechanical issue. The race was red flagged for a crash involving Katie Smith in turn 3. She was transported to a hospital for treatment but was awake and alert. After the delay, Stephens would lead the remaining laps for his first feature win at Lawrenceburg. Skeens finished second followed by Gary Whitt, Michael Freimuth II, and Cordell Moore. Heat race winners were Jake Stamper, Brandon Stephens, Dallas Miller, and Cordell Moore. Gary Hume won the B Main. 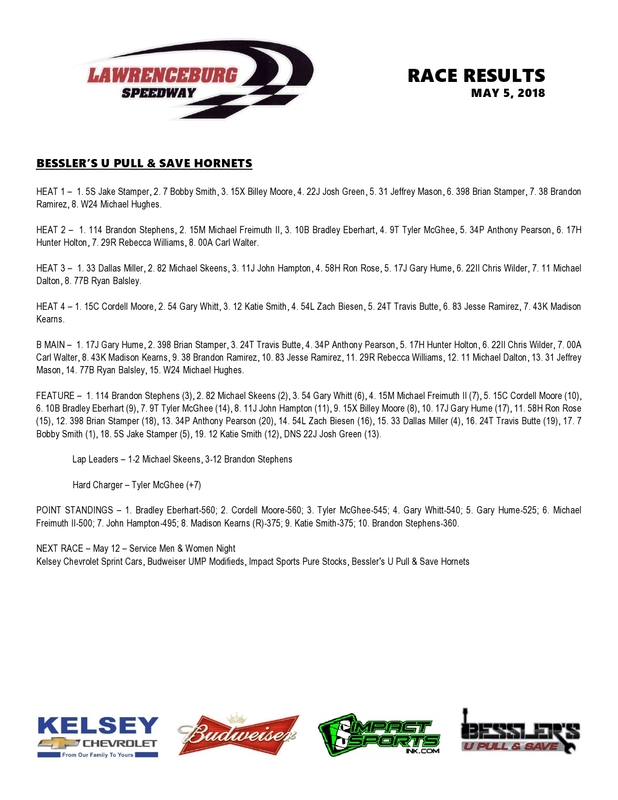 The Besslers U Pull N Save Hornets return to the track on Saturday May 12th. Steve King wins First Purestock Feature! Steve King won his first Purestock Feature at Lawrenceburg Speedway Saturday night. He hadn’t won in 19 years and had previously won in a modified at the old ¼ mile Lawrenceburg configuration. Don Grace ran second followed by Danny Eichler, Mike Ackman and Dalton Smith. Heat race winners were Eric Sandlin and Steve King. The Impact Sports Purestocks return to Lawrenceburg on Saturday May 12th.